I have to give 100% of the credit for Five Favourites Friday to my wonderful other half and his new blog. He decided he was going to do a post every Friday containing five of his favourite things. He then urged me to do the same on my blog! With the idea in mind that in the future we could collaborate on our Friday posts, I agreed. 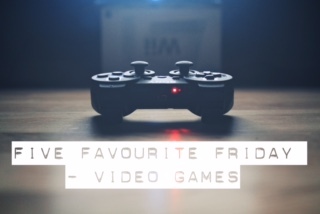 And so begins Five Favourite Fridays! 5. Rollercoaster Tycoon. I love the sandbox games where you can really let the creativity flow. And in this game you really can go crazy. No matter how many different sandbox games are released, this is one I will always come back and play for hours on end – it’s just too addictive! 4. Terraria. Another sandbox game. I like Terraria because it really makes you think about what you’re making as it’s all in 2D. Also, there are loads more mobs and bosses as well as different things to craft compared to other sandbox games such as Minecraft. 3. Gears of War. First or third person shooter where you fight against the Locust who are trying to take over earth. I prefer this to other first person shooters such as Call of Duty as I feel the controls are a bit smoother and I love the storyline. 2. Pokémon Go. Yes yes I know, you’re probably sick of hearing about Pokémon Go and are probably wondering when the hype is going to die down. I’m not sure that it will. I think it has been really good for a lot of people. It’s helped get people out of the house, get people moving – did you hear about that one guy that lost something like 30kg just playing Pokémon Go? Whether you love it or hate it, I feel it’s been a really good game in helping people overcome fears, lose weight, get fitter and simply get out of the house and away from those TV screens. 1. Plants vs Zombies. I was playing this game before it became popular. I love how addictive this game is. Once I start playing I can be on it for hours! I love the Chompers and the Gatling Pea Shooters! And who doesn’t love Crazy Dave? So there you have my top 5 video games. Are there any you disagree with? What would be on your list?